The top 10,000 Fantasy Premier League managers have swooped for Manchester United assets after the strong start they have made under Ole Gunnar Solskjaer. Meanwhile, there has been a non trivial activity in the chips department this week mixed between Wildcards, Bench Boosts and Free Hits. 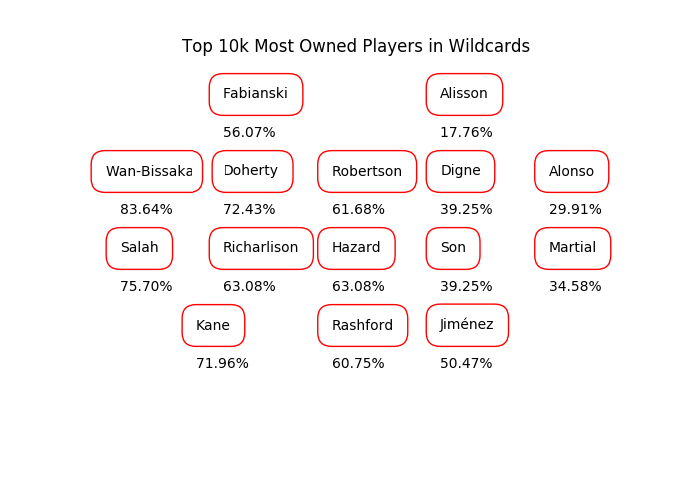 Looking at the spike of interest in United assets, we notice that, for the first time for at least ten Gameweeks, there are four Red Devils players with ownership higher than 10% at the top end of the game. We see that some Man United players went from almost zero percent ownership (Jesse Lingard (0.25%), Paul Pogba (0.9%) and Luke Shaw (0.6%)) to significant backing in a matter of the three days between Gameweeks 18 and 19. The most popular United asset is Marcus Rashford who left his 35.8% owners disappointed today with his blank. Speaking of disappointment, the second most-owned United player, Anthony Martial, was not included in the match squad today, which means that the 22.5% top 10,000 managers who own him will have called their bench for help. However, maybe that was not very disappointing as many have Aaron Wan-Bissaka as first substitute, and he is projected to get eight points this Gameweek after bonus points. Meanwhile, the 10.1% managers who own Pogba this week certainly enjoyed his brace, which is the main reward Man United owners got today, plus the Lingard assist. This Man United bias manifests itself even more in active Wildcards this week. 2.14% of top 10,000 managers delayed their first Wildcard up till this week, and they certainly made sure they got their Red Devils cover. 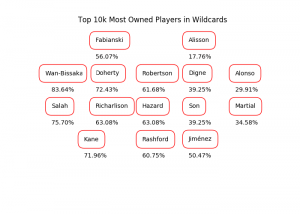 Rashford (60.75%) and Martial (34.58%) are the popular Wildcard picks, while Pogba made it to 27.43% of them. Wildcarders also favored Wan-Bissaka, Andy Robertson and Lucas Digne in defense and Mohamed Salah, Richarlison and Heung-Min Son in midfield who all proved to be decent picks for Gameweek 19. On the other hand, 0.5% activated their Free Hit chip and their selection looks very similar to the Wildcard picks. Pogba features much more than Martial in these one-week only squads. In addition, 1.1% found their bench promising enough to activate the Bench Boost chip and not wait for future opportunities. Taking a look at the benches of those teams (loosely defined as the cheapest players in their squad), we find the following players constituting most of the substitutes. It was essentially Wan-Bissaka’s clean sheet and Digne’s brace that rewarded Bench Boosters this week. As this article was being finalized, the average intermediate scores for different chip users show that Free Hit (14 intermediate points gain over no chips) was actually the most successful this week (numbers are before the Watford-Chelsea game). Meanwhile, Triple Captainers (mainly captaining Salah) are second with a 10.1 gain. Is alli to son -4 foolish? Not sure about alli injury status? Have no Kane if that helps. How many games before Son goes to Asian games? I dont see much point taking hit for Son, he might get rested already next game, and plays max 3?? games before leaving? Salah back to his best form = Salah essential? If so, better to buy him before he is 13.3 or 13.4... because then he becomes almost unreachable for the rest of the season. Could Sigurdsson score as many points as Salah over the next 6 GWs? Maybe... but factoring the captaincy, probably not. I dont think Salah will do much points next 2 games. He will defo score vs Arsenal. Will captain him if I get him back. Buying him before Arsenal and City, could backfire. Do both defense look assuring atm? Hence got him yesterday taking multiple hits. Hopefully hits will be covered in 1-2 gws. Jiminez + Hojberg > Rich + Kamara (-4)? Would you be able to do it for Lingard + Calvert-Lewin? Which pair for the next 2? Better enabler from now on: Snodgrass or Deulofeu? Same price. Kola & Fraser to Shaw & Pererrya? I'd keep Fraser long term. Ditch Kola to Digne? Digne is certainly on my watchlist. Get him before he becomes expensive. What on earth to do with Sterling? Gone so far off the boil last 4 games - and have only seen MOTD of Leicester/Palace games but seems like he’s failing eye test as well. Get in Pogba, Lingard or Sane? No other City players so Sane seems logical. Hazard/Salah would be my first choice. Out of those, I would go for Pogba. Have Haz. Salah too much for my team. Yep, he has had a few below par performances of late to say the least, can see Mahrez getting some more game time! Which changes are the best? I can't recommend any that involve getting Arnie. As good as he is, he's so brittle, esp after coming back from injury! I thought he'd make a good differential option, but you're probably right. Is arnie fit to play this gw? No Kane or Salah? I'd be addressing that first. What's your team value? What to do here guys? Still can’t believe Digne man. Had absolutely no autosub luck so far this season. Felipe Anderson to get the sniffles...Please!?!? Same here buddy. Spanked by Spurs then goes haywire at turfmoor. Damn Judas. Ings and Snoddy for me. I agree. Me too, but he had just shipped 6 at home. Thought confidence would be low. 2FT's, what to do with this lot? Honestly short on good ideas... been sort of hovering last few gameweeks. Looks pretty good tbf Sane to Son and roll? Hijberg, Jiminez to Kamara, Perreyra? I dont like bennet, how about peltier? This is going to be a form of self help therapy. So bear with me. I know there are a few others who made similar choices. Benched Pereyra, Digne and WB. Also took a -8 hit to get the United boys. Net loss 36 points. It all seemed logical. Doherty over WB, Alonso over DIgne ( who had just given me a -4 vs Spurs ! ). Playing Jiménez over Pereyra was another wrong call but did not want to play him vs Alonso. Lessons ? Just play who you have, don’t take big gambles, and play the homer if it is a 50/50. Any other tales of woe to make me feel better ? You did not really do anything wrong and had/have a great team apparently. Also, Digne will not be scoring fks or easy long rangers every week (even though I just brought him in and hope for that). Who would you play for Gw20? How did Rashford look yesterday? Already have some plans for that spot because of wc. Dalot missed a sitter from his cross. Unlucky not to get the assist from the corner which Matic scored from (deflected off someone else) and had two good chances himself to score. I'm keeping him in. One wc draft. Annoying first gw due to fixtures but otherwise liking it. Is Sterling/Mitrovic to Pogba/Aguero stupid? Kun had an xG of 0.76 yesterday, feel like once he's found his legs there's a massive haul incoming.